Do you want to use content marketing to build a (highly profitable) business? After dozens of interviews we discovered the pattern to success. 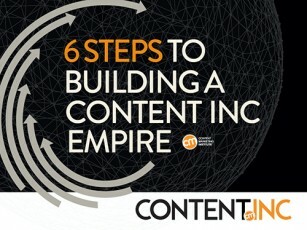 Download this e-book to learn about each step of the Content Inc model that you replicate. You’ll also learn the story of Joy Cho, entrepreneur who has built her business from content. And, by downloading, you’ll also subscribe to CMI’s weekly newsletter to learn more about content marketing for your business, large or small.